Entomopathogen Beauveria bassiana is a soilborne fungus which is commercially available for pest management in organic and conventional agriculture. Although numerous studies demonstrated the interaction of B. bassiana with various arthropod hosts as a pathogen, information on its interaction with plants is limited. Some recent studies investigated the endophytic (growing inside the plant) interaction of entomopathogenic fungi with different species of plants in an effort to understand the impact on arthropods feeding on the plants and antagonistic effect on plant pathogens. When an entomopathogen is present in a plant as an endophyte, it may not cause infection in its arthropod host, but can affect its growth and development through (fungal) toxins. This interaction could be utilized to improve pest control efficacy and improve plant health. To evaluate the ability of B. bassiana to endophytically colonize strawberry plants, two greenhouse studies were conducted in 2010 using a commercial isolate (GHA) and a California isolate (SfBb1). The first study examined three methods of inoculating strawberry plants where dry conidia of B. bassiana were mixed with potting medium (1X10^7 conidia/gram of vermiculite), strawberry roots were dipped in conidial suspension (1X10^7 conidia/ml) prior to planting, or 100 ml of conidial suspension (1X10^7 conidia/ml) was applied at the base the plant. Care was taken to prevent the contamination of aerial parts of plants with fungal inoculation. Each treatment had four potted plants and a set of untreated plants was used as control. Root, petiole or pedicel, and leaf lamina or sepal or calyx samples were collected 1, 3, and 6 weeks after inoculation to test for the presence of B. bassiana. Plant material was plated a selective culture medium after surface sterilization with bleach solution. Fungal growth from the plant tissue was microscopically examined and identified. Beauveria bassiana emerged from all plant tissues – roots underground to all aboveground parts – throughout the observation period. Among the inoculation methods, root dip and application of conidial suspension caused 52 and 44% of tissue colonization, respectively, followed by 4% colonization from mixing dry conidia. The second study was conducted to evaluate colonization of B. bassiana at 1X10^9, 1X10^10, and 1X10^11 conidia/ml concentrations. Application of conidial suspension was chosen as it was the easiest means of inoculation and also practical to administer through drip irrigation system in the commercial fields. Treatments were administered by applying 100 ml of respective concentrations of conidial suspensions around the plant base. Plant tissues were sampled 1, 3, 6, and 9 weeks after inoculation using the abovementioned protocol. Data were subjected to statistical analyses and significant means were separated using Tukey's HSD test. Both commercial and California isolates colonized all sampled strawberry plant parts for up to 9 weeks after inoculation (Fig. 1). Due to the limited number of plants used in the study, sampling could not be continued beyond 9 weeks. Fig. 1. Proportion of various plant parts endophytically colonized by commercial (GHA) and California (SfBb1) isolates of B. bassiana at 1, 3, 6, and 9 weeks after inoculation (WAI). Fig. 2. 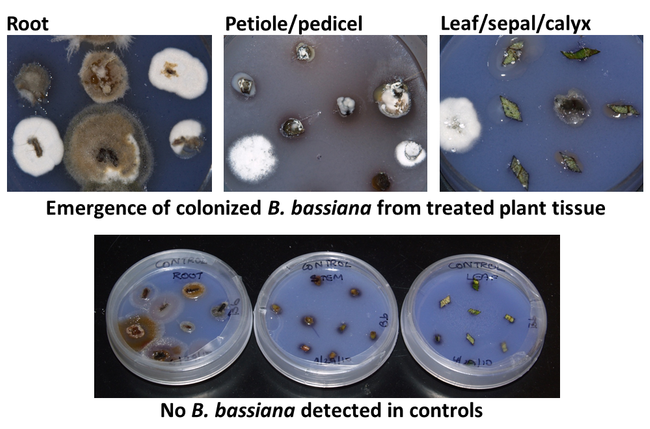 B. bassiana emerging from various plant tissues compared to no signs of B. bassiana in control plants. When concentrations were compared, fungal colonization of plants was the highest at 1X10^11 conidia/ml only for the commercial isolate (Table 1). There was no significant difference among conidial concentrations for the California isolate. In general, colonization was first noticed in roots and then the fungus moved up to the aerial parts. This trend was more evident for the commercial isolate with significant differences at 1X10^10 conidia/ml. Although not significant, it appeared that the commercial colonized strawberry plants more than the California isolate. Table 1. 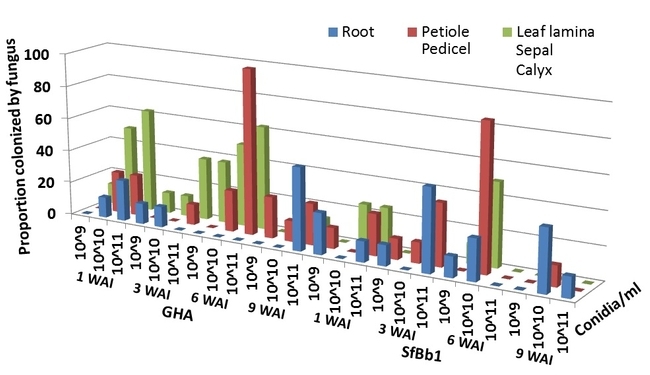 Proportion of different strawberry plant parts endophytically colonized by commercial (GHA) and California (SfBb1) isolates of B. bassiana at various conidial concentrations. *Average colonization of all plant parts for GHA isolate was significantly different at different concentrations P=0.03). Means followed by the same lowercase letter or no letter in the column were not significantly different. **Colonization was significantly different among different plant parts at 1010 conidia/ml for GHA (P=0.01). Means followed by the same uppercase letter or no letter in the row were not significantly different. These are the first studies to demonstrate that B. bassiana endophytically colonizes strawberry plants. The impact of endophytic B. bassiana on arthropod pests attacking strawberry plants was investigated in other studies. Acknowledgment: Thanks to Dale Spurgeon, USDA-ARS for providing laboratory and greenhouse resources for these studies.